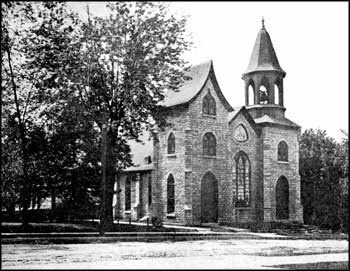 Soon after the opening of the Collegiate Institute, the First Presbyterian Church Building was dedicated on Feb. 17, 1856. This building stood immediately adjoining the present church structure and was a small brick building, 28 by 42 feet. A short time afterward, a group of New England Congregationalists enlarged the church fellowship and it became necessary to seek larger quarters. The Congregationalists had met with the Methodists of Dixon prior but this was not satisfactory because of the growing membership in both churches. On Jan. 1,1858, the Presbyterians moved to a building located in North Dixon which had been formerly occupied by the Unitarians. This was done so that the Congregationalists could have a building to themselves. During the Civil War period these two congregations differed on issues of slavery and states' rights and went their separate ways. It was also during this period that Dr. Harsha left the pastorate of the church, moving to a church in Chicago. Dr. E. C. Sickels, second pastor of the church was installed on June 1, 1863 and served some 32 years, the longest pastorate record for the church. It was during his tenure that the present church structure was built at a reported cost of $5,000 and constructed of dressed Trenton Limestone. (same type of material used for the street arches on 1st, 2nd and 3rd Streets) The church was dedicated on Oct. 28, 1866. The sermon was preached by Dr. Harsha, who had been the first pastor of the congregation. During 1897, it was necessary to increase the size of the building and an addition was added at a cost of $3,500. The church was once again enlarged by the addition of an educational building in 1952. A feature of the building is a 130 foot bell tower with a bell weighing over 2,000 pounds and that was converted to an automated system in 1969. The First Presbyterian Church has been at its present location at 110 East Third Street since 1864. This makes it the oldest church in Dixon still using its original facility.